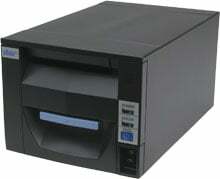 Star FVP-10 - Thermal receipt printing, 250 mm/sec, front exit, auto-cutter, USB interface, internal speaker. Includes driver CD, USB cable, US power supply and platform extension. Color: Gray. Also known as FVP-10U GRY Platform. The Star FVP-10 features an ultra high print speed of 250 mm/second and front paper loading for easy paper roll changing. Its square design & front paper loading allow for it to either be easily under-counter mounted or used as a platform to mount other POS devices. The FVP-10 can support up to 7 pounds of accessories on its top. Text to voice feature enables users to communicate important information with both staff and customers. Voice alerts to remind an operator to start a specific task can easily be programmed. The Star 37962270 is also known as Star Micronics	STA-37962270	.